Here is a little mental letter I wrote this morning when I woke up to...SUN! Actual sun in San Diego! I wish you knew how pretty you are when you are sunny. This May Gray/June Gloom situation does not suit you very well. You are one of the prettiest cities in the world and I don't understand why you hide under this gray marine layer during two of the best months of the year. You glow in the sun - your beaches are brighter and your buildings sparkle. You are at your best in the sun, SD. Stay this way! What are your favorite bright accessories? Do you like adding color in your purses, shoes or jewelry? Oh and speaking of bright and yellow...there is still time to enter my lace necklace giveaway!! 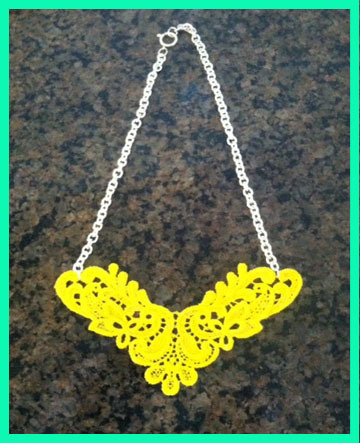 If you want something bright to make your outfit pop, you definitely need one of these! Right? Thanks Elly. I am kind of obsessed with yellow right now! Will definitely be checking out your blog too!